So even we had the money, still the sanction of the Supreme Lord is needed. Without His sanction nothing can happen. So it looks like the will of Lord Caitanya is there now. The land is cleared, the model is accepted, test piling has begun. Everyone is in agreement, at least all of the authorities. It is happening now, the desire of Lord Caitanya is there. This is a very auspicious time, and historically important also. Finally, after all of these years, this temple is being built. There are predictions given in the Sri Navadvipa-dhama-mahatmya. Lord Nityananda Prabhu told Srila Jiva Goswami that after Mahaprabhu leaves, the Ganga will come and flood the whole area for a hundred years. Then for the next three hundred years, the Ganga will move around and all the pastime places get washed away. Then He said, after that, again the task of revealing the dhama will begin again in earnest. ...I would say that Bhavananda Prabhu probably had more instruction about this Temple of the Vedic Planetarium than anyone else. Because he was always here, he was the co-director of Mayapur and he stayed here for many years while Srila Prabhupada was here.So that corresponds to exactly the time when Srila Bhaktivinoda Thakura was here and he rediscovered the birthplace of Lord Caitanya. 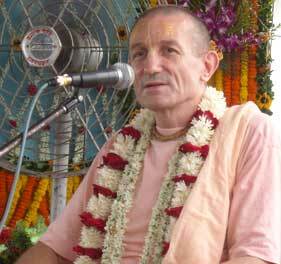 Then Nityananda Prabhu says many bathing ghatas will be built on the Ganga, which we are seeing happening now. Just a few days ago, I think it was the day of the ground breaking ceremony, we received confirmation from the Ministry of Tourism that they will spend several crores of rupees to build a nice ghata where Prabhupada's ghata is. This is to promote tourism; bringing people by speed boat from Calcutta and other places. 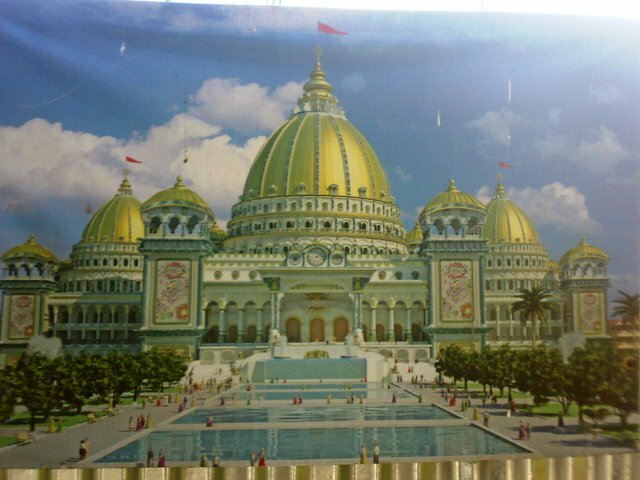 They were going to build it at some other location, but when they saw that everyone is coming to ISKCON anyway, they said if you give us the land we will do it for you. So this also seems right on time, and everything appears to be very auspicious. This is the prediction of Nityananda Prabhu, so it is happening. This was his explanation of the adbhuta-mandira. It is a very, very wonderful project. And Nityananda Prabhu said, gauranga nitya-seva haibe vikasa, that from this temple, service to Lord Gauranga will spread all over the world. 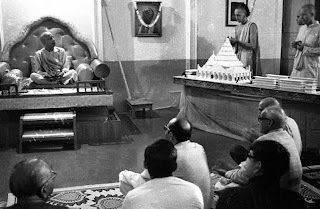 How do you serve Gauranga Mahaprabhu? By chanting Hare Krishna. This is the main service. He has come to give this, the holy name. So from this temple, the chanting of Hare Krishna goes to every town and village of the world. Prabhupada described it as a flood of love of God. He said in a Sri Caitanya-caritamrita purport, "In Sridham Mayapur there is sometimes a great flood after the rainy season. This is an indication that from the birthplace of Lord Caitanya the inundation of love of Godhead should be spread all over the world, for this will help everyone, including old men, young men, women and children." It will happen from this temple. So we have to build this temple, at least we can do that much. Then it is up to the Lord when the holy name spreads to every town and village. Of course, that is the ambition of every devotee in ISKCON, or at least it used to be. We are just longing for that day. This is our ambition, our dream. Most probably, this is one of the greatest preaching projects of our time. Following in the footsteps of Srila Bhaktivinoda Thakura, who established the first temple in Sri Dham Mayapur, we expect everyone to "contribute their might" for the successful construction of Mahaprabhu's temple.